Leonardo’s study of nature and his ability to interpret its rules allowed him to create new forms and effects even in his early paintings. In the Madonna with the Carnation, the skillful foreshortening of the Virgin’s hands and the fatty folds of the child’s body are a testament to his study of the life model. The chiaroscuro modelling of the figures conveys their three-dimensionality in a way made possible only by the study of light and shade in nature. The colours of the Virgin’s costume are subdued by shadow indicating an unprecedented awareness of the complex effects of light on colour. The light that illuminates the forms comes from the upper left and not from the windows. The effect is artificial and yet totally convincing. The folds of the Virgin’s veil are reminiscent of Leonardo’s studies of water. It spills over her left forearm in a similar manner to the waterfall in Leonardo’s Landscape Drawing. Other paintings may also have provided inspiration for Leonardo. The crystal vase on the right and the Virgin’s brooch betray the influence of Netherlandish painting, which Leonardo much admired. Painting requires more thought and skill and is a more marvellous art than sculpture, because the painter’s mind must of necessity enter into nature’s mind in order to act as an interpreter between nature and art. 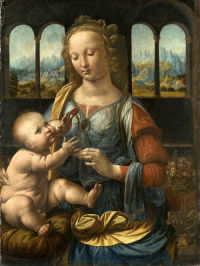 Although elements of this painting, such as the vase of flowers and the Virgin’s hairstyle, call to mind works by Verrocchio, the assured handling of colour, particularly in the draperies and the landscape, support the attribution to Leonardo, as does the novelty of the overall pictorial design. In this ambitious painting, Leonardo sets out to rethink the traditional representation of the Madonna and Child in Florentine painting. Perhaps influenced by Netherlandish paintings of a similar type, Leonardo situated the mother and child in a richly shaded, intimate, domestic interior. The forms of the figures are successfully modelled by in dramatic chiaroscuro lighting to achieve an unprecedented sense of plasticity of form. The dark interior is in sharp contrast to the brightly-lit and expansive landscape vista seen through the double windows behind, where vast mountains can be seen receding far into the distance. Here, Leonardo continues to develop his innovative technique of aerial perspective, successfully replicating the effects of light and atmosphere in a new way through the application of colour.